I often wonder whether the bizarre situations I find myself in when I travel are a reflection of the craziness and unpredictability of the places I visit; or simply that, when travelling, I consciously open myself up to new experiences that, at home, I would not. I’m inclined to think it’s a potent combination of the two. The following events took place when I was living in Quito, Ecuador. When it rains there, which is sadly a daily event, it really rains. The clear mornings give way to the blackest of clouds, sweeping in from behind the volcanoes to the west, which empty their load onto the city with very little warning. So at half past three in the afternoon I should have known better than to be walking home. The rains should have started around hours before – I was definitely on borrowed time. The sky was the colour of blackened steel, and I quickened my pace. Too late. As I hit the middle of El Ejido park in the city centre, the first enormous drops fell. Five seconds later, I was sprinting under the trees to the shelter of a lone building surrounded by the park. I huddled in the doorway with a couple of other unfortunate folk. I was completely trapped – had I been by a road I coud have jumped into a taxi. But simply crossing the park would have resulted in a thorough soaking. The pounding increased in volume – the ice storm had begun. Never pleasant, these flurries of huge hailstones are all the more disruptive in Quito thanks to the architectural preference for cheap plastic and corrugated metal roofs. If you are lucky to be inside a building when one of these storms is taking place, conversation is impossible through the deafening racket. A woman soon appeared in the doorway and insisted that I come inside the centre. I assumed she was protecting me from the ice and rain, but she hissed “Be careful – he’s a thief!” and whisked me away from the soggy hooded man by the door. I sat on an old sofa of what appeared to be an art studio and watched as an assortment of hand painted pots and pans and carved wooden bowls were placed around the floor, catching the water pouring through the perforated plastic roof. Given Quito’s climate and the way the woman didn’t bat an eyelid, this was probably a daily ritual. An old man came and sat next to me and chatted. His name was Fernando and he was a teacher, and this was a community Art Centre. I told him I’d studied Fine Art. “Well, I’d really like to go home, but…” I yelled over the drone of the ice storm. Fernando busied himself taping paper to one of the many empty easels around the room. “Would you like to draw a foot?” he enquired, sharpening a pencil with a stanley knife. Fernando rummaged around in a drawer. I realised he hadn’t specified what kind of foot. A lucky monkey foot, perhaps? I remembered the barman I’d seen a few nights before, scooping Argentinian mate tea out of a cow’s hoof pot. But Fernando pulled out a plaster cast of human foot – a man’s foot by the size and shape of it, and set it up on a red cloth on a little plinth. I chatted to a couple of the students as I drew, and Fernando monitored my progress, jumping in to draw guiding lines where he thought necessary. As the tempest eased, I finished my drawing. It felt like half an hour had passed, but it was in fact nearly three times as long. “There! Now you have a souvenir to remind you of the day you sheltered from the rain in Quito.” Fernando said, rolling up the work and taping it tightly. He invited me back any time I liked, he was there on Thursdays and Fridays, he said. I exchanged numbers with another student, who invited me on a day trip to “The Middle of the World” – the equator line – the next day. The drawing’s up on my bedroom wall now. 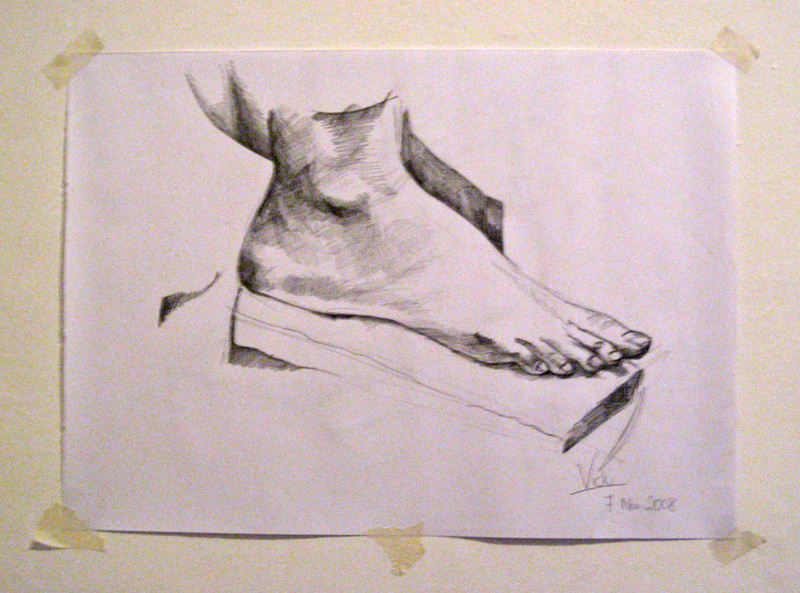 It’s definitely not the best study of a foot, but my walls were bare, and I like to remember my stormy afternoon in the Ecuadorian Art Centre. Tags: art, drawing, ecuador, quito, rain, storm, travelling, unexpected. Bookmark the permalink. Previous post ← The World’s Greenest Bag…?